Pima County voters approved Proposition 415 in November 2014 authorizing the county to borrow up to $22 million to improve Pima County's animal care facility. The New PACC will accommodate the thousands of pets brought to us for shelter and will allow for more modern animal care practices. Pima County Director of Facilities Management Lisa Josker is leading this project. The County and its consultants, Line and Space, LLC., and Sundt, are more than halfway done with the construction work for Phase 1 of the new facility. We're right on schedule to open our new animal care facility before the end of December. Thanks to the community who approved the bond in November 2014, Pima Animal Care Center will soon operate from a state-of-the-art, award-winning, animal shelter that meets modern day standards. To see photos and video of the construction progress, visit PACC's Facebook page. Sundt contractors started physical construction of the new PACC facility on Feb. 1, 2017. The building currently under construction, which is Phase 1 of the project, will open to the public December 2017. When complete, the new shelter will have all the necessary features to ensure it meets modern day standards recommended for animal care facilities across the country. Features include separation of species throughout the facility, adequately sized housing areas for dogs and cats, and improved natural light and ventilation in pet housing areas. Phase 1, specifically, will include a new adoption center, veterinary clinic, admissions area, and other critical spaces. The County held the ground-breaking ceremony for the construction of a modern Pima Animal Care Center facility on Oct. 4, 2016. The ceremony marked the beginning of construction for Phase 1 of the project, which will primarily construct the new portions of the facility east of the existing building. The new areas will include an expanded veterinary clinic, a recovery area for pets who receive medical treatment, the pet admission area, a lobby, and the administrative offices for PACC staff. Fresh air and natural lighting throughout the facility. Well-designed plumbing and cleaning systems for pet housing areas. Expanded cat housing areas – nearly triple the size of the existing. At the completion of Phase 1, the public, PACC’s pets and staff will move to the new building while the remodel and partial demolition of the existing facility takes place. Full completion is expected in 2018. On June 7, 2016 the Board of Supervisors unanimously approved a $200,000 contract with Stoller Studio, Inc. to design and install public art at the voter-approved facility. In March 2016, Desert Archaeology, Inc. began excavating the construction site of the new PACC facility. The excavation, led by the Cultural Resources and Historic Preservation Division of the county’s Office of Sustainability and Conservation is a required process for all construction projects. Since the 1970s, county taxpayers have funded the protection and conservation of dozens of cultural and historic sites and amenities throughout the county. Archaeological studies, such as this one, further the county’s preservation efforts of culturally and historically significant sites. To date, archaeologists at the new PACC site have uncovered several artifacts dating back to approximately A.D. 550. Their discoveries come as no surprise considering the site’s proximity to the Santa Cruz River. Archaeologists have traced the remnants back to Hohokam farmers, who happened to love dogs as much as PACC does today. These families built their homes from local materials and produced impressive crafts, including some shell jewelry, which archaeologists recently uncovered. The progression of this archeological excavation has led to major changes at PACC's existing facility. In April 2016, PACC's dispatch office relocated temporarily to the Abrams Public Health Center, 3950 S. Country Club Road. And as of July 2016, PACC’s clinic, TNR program, and administrative offices have all moved to a temporary location onsite. See PACC's temporary construction map for more information. These moves will allow Desert Archaeology to complete its study and allow contractors to prepare for groundbreaking. About 200 people attended a presentation of the Design Concept Plan Oct. 20, 2015 at Abrams Public Health Center. County project managers, PACC staff and Line and Space architects presented the plan. The Concept Plan is a conceptual floor plan that highlights the location of key areas, such as the animal housing and veterinary clinic. The plan includes an overlook of the potential space on the existing site. Architects have incorporated community and stakeholder feedback to ensure that the new facility meets modern shelter standards and also suits the existing needs of PACC staff and its homeless pets. Although the design of the new PACC is not finalized yet, the preliminary design generated a significant response from the community. People were excited to see the various meet and greet sections scattered throughout the facility where potential adopters and volunteers will have an opportunity to interact with the animals. They also praised the incorporation of natural light in the animal housing areas along with the proposed outdoor play yards for dogs and “catios” for cats. The architects received several questions about kennel space and shelter capacity at the meeting. While the new shelter won’t have double the amount of kennels, it will have significantly more kennels. The design of the new facility also accounts for a future decline in the number of shelter due to the County’s aggressive spay and neuter efforts and greater public outreach and education. In fact, we believe the improved facility design will prompt more adoptions, as well. View the Design Concept Plan. The public is invited to comment on the concept plan using this online form. Since voters approved the $22 million, modern animal care facility last year, the county has been hard at work following state and county procurement laws and time schedules to hire the architect and contractor. All of this preliminary work was necessary before design and construction of the new shelter could begin. Learn more about services the Pima Animal Care Center provides on its website. The original facility was built in 1968, when Pima County's population was about 300,000 and when animal facilities did little more than warehouse stray animals. The County's population has grown to nearly 1 million, and the center provided care for nearly 24,000 animals last year. PACC is the largest adoption agency in Southern Arizona. The live-release rate at PACC has doubled since 2008 due to such things as an improved adoption program, more partnerships with rescue organizations, expanded veterinary and medical treatment, and behavioral rehabilitation. Nearly 15,000 animal lives were saved in the past fiscal year, and PACC enforcement officers responded to nearly 28,000 calls for animal welfare and public safety in Pima County over that time. Pima County will be photographing new PACC construction progress through the grand opening. We've created a FLICKR page with all of the photos. Sundt Construction, Inc. completed a majority of the exterior work for Phase 1 of the new facility. The new building will open to the public this December. Governments or districts sell bonds to investors and use the revenue to fund capital improvement projects such as libraries, community centers and public health facilities. In this case, those revenues would fund an animal shelter. Has there ever been an independent review of the Pima County bond program? Yes. Aside from the regular oversight provided by the Bond Advisory Committee, an Arizona Auditor General's office audit of Pima County's 1997, 2004 and 2006 general obligation bond programs found that Pima County’s bond funds were used for the purposes the voters authorized. The audit also found the programs followed the approval process for any necessary changes and the programs benefited residents all over Pima County in similar proportion to the taxes paid. The full Auditor General's report can be found here. Accountability and transparency are extremely important to us. The Board of Supervisors will be adopting a Bond Implementation Plan that will provide detailed descriptions of the projects that will be built if voters approve a bond program in an election. The Bond Implementation Plan Ordinance must be completed, approved and available to voters before a bond election. In the case of long-term projects, there are occasional changes in scope, costs or benefits that arise. Before any bond implementation plan can be changed, there must be a public hearing before the 25-member Bond Advisory Committee and the Pima County Board of Supervisors similarly must approve the amendments at a public hearing. Please visit our Commitment to the Community page to learn more. Q: Why is Pima County building a new Pima Animal Care Center? A: The Pima Animal Care Center was built in 1968 for 300 dogs and 100 cats. It originally held pets until they were claimed. 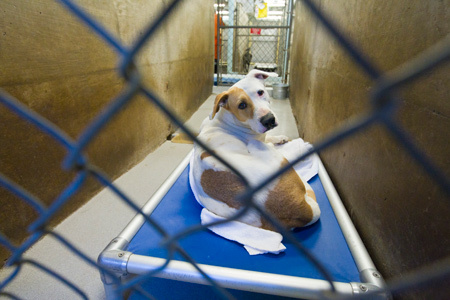 Unclaimed pets were euthanized in a matter of days. PACC’s mission has since changed to one of adoption and staff accept all pets presented for care. A new PACC is also needed because the existing facility’s design isn’t conducive to the mental and physical well being of our pets. Q: What is PACC’s current population? How many animals do they receive annually? A: PACC’s daily population is around 800. Another 500 pets are in foster care. PACC receives roughly 25,000 cats and dogs annually, or about 400 a week on average. Q: What is an open admission Shelter? You may have heard that Pima Animal Care Center is our county’s only open-admission shelter. This means we take in every lost, injured and unwanted pet who comes to our doors – regardless of whether the person bringing the pet to us can pay a fee. Q: Why should we care that PACC is over-crowded? A: Over-crowding can allow diseases to spread more easily, it is stressful to the animals, which can lower their immune systems, and it can lead to fights that cause injury. Q: What other steps have the county taken to relieve over-crowding? A: The County erected a semi-permanent 120 X 60 foot tent to hold 100 kennels and ease over-crowding in March 2014. The county has also improved its adoption program, formed more partnerships with rescue organizations, and expanded veterinary care and behavioral rehabilitation. The tent is temporary and has lighting, heating, cooling and sanitation deficiencies. Q: Are more animals being adopted? A: Yes. Since 2008, PACC’s live-release rate has doubled from about 45 percent to just under 90 percent. Nevertheless, the facility remains over-crowded because keeping an animal until it is adopted means the average length of stay per animal has increased. Q: How much will the new PACC cost? A: Officials estimate $15 million will be used for the construction of the new facility. The remaining $7 million is allocated for the purchase of furniture and equipment, design/engineering fees, Pima County administrative/project management expenses, and other miscellaneous costs. Q: What is the size of the new PACC facility? A: The current plan reflects a total gross interior floor area of just over 63,000 sqft. More than 95 percent of this total area is allocated to functions that directly house or support the housing and adoption of animals at PACC. For comparison, the existing building is more or less 39,000 sqft. Q: When will construction begin? A: Work to prepare the site for construction will continue through 2016, with a groundbreaking for major construction tentatively planned for December 2016. A: Completion of Construction is currently scheduled for late 2017. Most of 2016 will involve developing and documenting the design and the focus of 2017 will be on construction. Q: Why won’t it open sooner? A: Pima County Facilities Management Projects typically take three years to complete. It usually takes several months to hire the design consultant, one year to design, and 10 to 18 months to build. Recent examples include the Crisis Response Center, The Regional Wastewater and Reclamation Lab, and the Wheeler-Taft Library. Much input has been sought from the public on the design to make sure Pima County builds the shelter the county and the public want and need. A slightly smaller animal shelter than the one planned for PACC just opened last year in Denver. It took 2.5 years to design and build. New PACC is currently on a similar timeline. Q: What will happen to the animals and staff during construction? A: The Pima Animal Care Center will remain open for business throughout construction of the new PACC. Q: How will the new PACC’s number of housing units for cats compare to that of the existing facility? A: The quantity of feline housing units will increase from 150 in the current facility to 200 in the new facility and be designed to minimize stress on cats (which can decrease illness in the shelter environment). Planned housing unit quantities for cats are based off of the UC Davis Koret Shelter Medicine Program’s recommendations after analyzing PACC’s operations along with historic, current, and anticipated future intake numbers. Q: What is the size of the area dedicated to sheltering of cats in the current plans for the new PACC? A: Current plans for the new PACC nearly triple the area dedicated to cat housing, with approx. 3,120 ft2 compared to ±1,258 ft2 in current facility. Q: How will the new PACC’s number of housing units for dogs compare to that of the existing facility? A: The quantity of canine housing units will increase from 285 in the current facility to 431 in the new facility, the majority of which are planned to be indoor/outdoor type. Many of the dog runs in the existing facility are not sub-dividable or do not have outdoor portions. Housing unit quantities for dogs are based off of Koret SMP’s recommendations after analyzing PACC’s operations along with historic, current, and anticipated future intake numbers. Q: How is construction of the new and renovated parts of the facility phased? A: Phase one will primarily construct the new portions of the facility east of the existing building, which will remain in operation and open to the public. Upon completion, animals, staff, and the public will be able to use the new buildings and the remodel/partial demolition of the existing facility (phase two) will begin. Q: Will the existing tent remain as part of the new facility? No - the tent and surrounding fence will be removed as part of the new PACC project. Q: How will the new facility positively promote the adoption of animals? A: The top priority of the new PACC is to create a design that provides for animal health and wellness with maximum efficiency and effectiveness while meeting taxpayer expectations regarding value and fiscal responsibility. A facility that is new, welcoming, and reflective of PACC’s mission to provide the best care possible (even in the remodeled portions) will improve public perception even further and lead to increased adoptions. Q: Why are parts of the existing facility being reused instead of demolished? A: Renovating parts of the existing facility will allow the project to meet the housing recommendations and other functional requirements, while conserving funds and physical resources (sustainability) and delivering maximum value to the taxpayers of Pima County. Q: Why not renovate existing PACC animal areas to be staff offices or other non-animal spaces? A: This alternative was considered carefully during the concept development, and existing cat housing spaces will be renovated to house human-use functions such as the Shelter Supervisor’s Office and Volunteer Break Room. For the main-floor dog housing spaces, however, adjacencies (or separation of like functions) created by using this space for offices, et cetera would create inefficiencies that would negatively affect PACC’s operations and the flow of animals through the facility. Q: Are spaces for PACC staff being prioritized over animal-related areas? A: No - the design prioritizes high-quality and appropriately-sized housing facilities in the required quantities for PACC’s animal population and throughout the conceptual design, reductions were made to human-use spaces in order to reinforce this priority. Less than 5% of the total building area is allocated to functions that do not directly house or support the housing and adoption of animals at PACC (spaces such as administration offices, mechanical rooms, or rest rooms). Prior to the 2004 bond election, the Pima County Board of Supervisors substantially revised the Truth in Bonding Code, providing voters with greater assurance that their investments will be spent as they were promised. opportunities for the public to provide input on any substantial changes to projects that may become necessary over time. Please visit the Pima County Truth in Bonding website to learn more. A local ordinance adopted by Board of Supervisors prior to early voting can be found at this website. It provides detailed descriptions of the proposed Pima Animal Care Center facility improvements (page 3-6), how cost estimates were developed and evaluated (page 6-7), and an estimate of how issuance of these bonds would impact property taxes (page 7-11).